While awards are nice, our passion for helping our customers is our only focus; these awards suggest that we are doing our job and helping our customers consistently, no matter their immediate roadside needs, and it’s that consistency that is being rewarded, so to speak! Canton Towing has become a trusted partner with law enforcement to help and assist clearing accident scenes. We currently have contracts in place with Canton Police, Stark Country Sherriff and the State Highway Patrol to help assist them. We take pride in the work we do and are honored to be working with such an important group of professionals in our community. To provide our customers with the best service possible, we have a fleet of 34 trucks with 31 certified operators on hand, ready to go to meet you and your vehicle, no matter what you need or where you need it. As soon as you’ve alerted one of our dispatchers, “I Need Canton!” we’ll have a nearby driver come to your aid. Our goal is to get you into a shop or back on the road safely in as short period of time as possible. 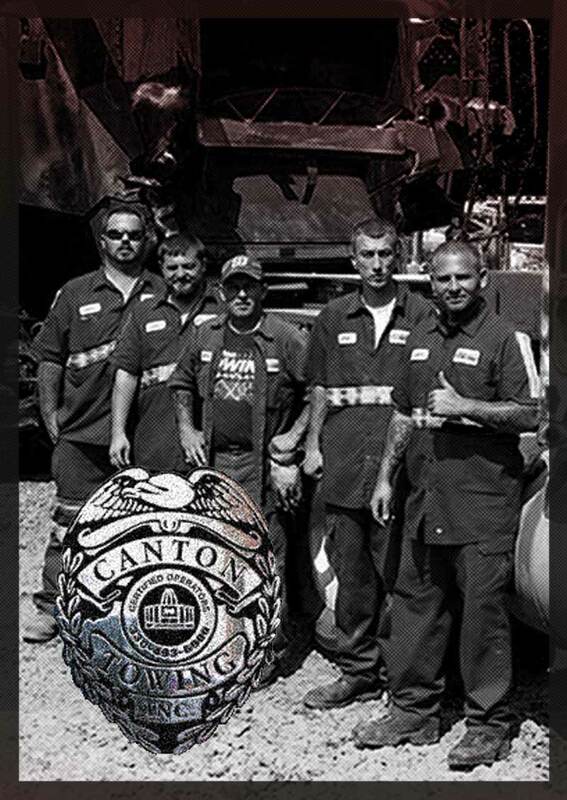 Canton Towing is proud to serve residents and businesses in Ohio with our award-winning services to our customers. We’ll work closely with you to get your vehicle in a shop or back out and on the road in no time. Light duty towing is for vehicles that are 10,000 pounds or less. So, Call Canton: our tow trucks are specially equipped to handle this type of towing without any damage being done to the vehicle. Most cars and small trucks fall into this category. Medium duty towing is designed for vehicles that range in weight from 10,001 – 25,000 pounds. These vehicles are options like delivery trucks, landscapers and bucket trucks. Our fleet of vehicles is designed to tow these trucks to any location you need; if you need us, Call Canton! These are vehicles over 25,000 that most standard tow trucks aren’t able to handle. To tow these vehicles, it does require a special towing setup, so Call Canton: we are able and qualified to tow city buses, fire engines, tractor trailers, and other heavy-duty machines. Some vehicles require that extra touch to get them safely from being transported to being back in service, and for those specialty tows, we have four Landoll Lowboy vehicles, so Call Canton: Landoll Lowboy Service is just a phone call away. Some heavy duty towing requires the use of a rotator, so Call Canton. Our team of drivers are trained to use this critical piece of heavy-duty recovery equipment. Not only will it allow Canton Towing to successfully move your vehicle during towing, it will also help to reduce the risk of damage to your vehicle. If your battery is dead, Call Canton and our roadside service drivers can come out to jump-start our battery. We’ll then guide you to the nearest location to pick up a new battery. Sometimes fuel gauges aren’t as accurate as you think they are, which can leave you stranded on the side of the road. If you run out of gas, Call Canton. We can have some fuel to you in no time at all. We’ve all had our keys locked in our vehicle at some point. If you find you are locked out of your vehicle, Call Canton! We’ll have someone out to help so you regain access to your vehicle. Whether your tire has just gone flat or experienced a blowout, Call Canton! Give our dispatch a call and we’ll have someone out to change your tire(s). To answer your questions quickly, we’ve compiled some of the most commonly asked questions. Yes. We are locally owned and operated by Joseph Coram. No. Canton Towing uses equipment that reduces the risk of damage to your vehicle. We are one of the safest choices you have for transporting your vehicle. Yes. All of our drivers go through rigorous training to work for us. We make sure they fully understand how to use all equipment and provide you with the best service possible. Yes. We have all the equipment needed for safely transporting your motorcycle without damage. Will You Charge Me More for Towing on a Weekend or Holiday? No. We offer our services at the same price, no matter what time or day it is. Our commitment is to giving our customers the best service possible, at an affordable price. Do You Maintain Your Vehicles? Yes. All our vehicles are routinely inspected and the regularly maintained. Yes. We will work with insurance providers if towing is covered on your policy. Do Your Drivers Require a Special License? Yes and No. Light duty tow vehicles do not require a special license, however, our larger vehicles do require special licenses. Regardless of what class of license our drivers have, we require our drivers to have perfect driving records.